A very cute movie musical. Tom Bowen (Fred Astaire) and his sister Ellen (Jane Powell) are the hottest musical act in show business. Their run in New York has ended and their agent Irving Klinger (Keenan Wynn) has booked a run in London with his twin brother, Edgar, producing. The run also coincides with the royal wedding of Princess (eventually Queen) Elizabeth. While crossing the Atlantic, Ellen meets Lord John Brindale (Peter Lawford). The two begin to spend a lot of time together, both on the boat and in London, and begin to fall in love. With Ellen off with her English Lord, Tom wonders the city alone. One day he meets a woman, Anne Ashmond (Sarah Churchill - Winston's daughter), on the street on his way to cast auditions. He soon realizes that the woman is heading toward his audition. Soon they begin to also fall in love. Both Tom and Ellen want to get married but what will happen to their act? This was a wonderful musical. 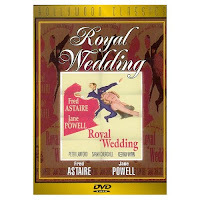 Two of Astaire's most famous dances - with a hat rack and where he dances on the walls and ceiling - are in this film. Jane Powell is wonderful. Her voice is amazing and so nice to listen to. The best song and dance sequence for me is also the song with the longest title in Hollywood - "How Could You Believe Me When I Said I Love You When You Know I've Been a Liar All My Life". All in all a cute movie for a Saturday in.